Study 22: Spiritual Gifts & Fruit – God’s Provision For Today; Fruit of the Spirit and Natural Talents | Grace 4 You Ministries, Inc.
We have stated that all the spiritual gifts, as mentioned in the biblical lists of gifts, have passed away. To most people, this is a controversial, radical, and an extreme viewpoint. In religious circles, extremism is the kiss of death (unless you want to be considered a cult), and this teaching seems well into the extreme category. Before you consider this teaching to be “too far out,” please consider that Grace 4 You Ministries does not need to support any particular denominational viewpoint, does not have to adhere to the writing of founding fathers, and is not compelled by religious organizations to follow their beliefs on this topic. In our personal studies, the alternative viewpoints and writings on this topic have been carefully considered. These studies on spiritual gifts and fruit are unfettered, that is, not constrained by others. We have a distinct advantage because we can freely teach the truth of God’s Word without constraint or fear of censure. What is presented here, on spiritual gifts, is scriptural and based upon sound exegesis. However, some people will say something like, “We knew a group who believed much like you teach, and they caused nothing but problems in the local church.” That may well be true, and it is unfortunate. Knowing the truth should not make a person contentious or cause them to create factions in a church. Those who did create problems in the Church are not being lead by the spirit, which we will discuss in this study. Knowing the truth sets you free to understand the Word and its Author. However, knowing the truth requires great care in expressing it so there is no needless offense. This study will help clarify many things that may be troubling you. For example, even if the gifts of being a pastor or teacher have passed, does that mean it is wrong to have a pastor or teacher today? As stated in the previous study, the office or function of pastors and teachers still exists, but how a person fills that office or function is the issue. Today, a person does not instantaneously fill the position by a direct gift from God, but though other means. Those who understand the gifts issue correctly, but do not understand that certain offices and positions still exist, have caused problems in local churches. Some of those who have come to see all the gifts have passed, have assumed there are no such offices today; thus, they believe there is no need for pastors, teachers, and evangelists. You can see this would cause great animus and contention in a church. This study will help establish the balance needed so we, per Paul’s instructions, can endeavor to keep the unity of the Spirit in the bond of peace. Discuss: Nothing in these studies suggests there should not be pastors, teachers, or evangelists today. We believe the need for these offices exists today, but it is important to know how a person becomes qualified to fill such an office. God works in our lives to renew our minds and transform our lives. As He transforms us, the Spirit produces within us something far superior to spiritual gifts. The Spirit produces His fruit within us. In addition to the fruit of the Spirit, we all have natural talents, skills, and abilities which, when properly developed, offer some of the functions formerly provided by gifts. Natural talents and abilities are God-given endowments to all humans. We can further develop our natural talents and abilities through study and preparation. Our natural endowments, coupled with the fruit of the Spirit, can enable a person to fill an office or position for the Lord’s work today. However, God will not instantaneously gift a person to fill that office; the person must study, prepare, and have the character traits required. There was no time for developing into a position in the first century, which is why people had to receive an instantaneous gift. The Spirit and His fruit provide the character traits and value systems necessary for any ministry; they also provide an internal guidance system, a necessity for any Christian endeavor to succeed. The Age of Grace stands in distinct contrast to Pentecost. At Pentecost, the Holy Spirit came upon the believer (an external presence); accordingly, they were blessed with external, temporary, sign gifts (gifts that can be sensed or experienced). In the early Church, the Spirit came within the believer and gave a mixture of sign and ministerial gifts. When our Age was fully revealed, the Spirit continued to indwell believers, but the spiritual gifts faded away. Clearly, what God is doing today is not the same thing as at Pentecost. With the Spirit within us, we have a more intimate relationship with the Lord; accordingly, we are given something internal, unseen, permanent, and special from the Lord. When the Holy Spirit takes residence within us, He works from our interior to transform our lives. His work has a beneficial outcome, that is, it bears results, which the Bible calls the fruit of the Spirit. The Spirit manifests His presence within the believer by the production of His fruit. “But the fruit of the Spirit is love, joy, peace, longsuffering, kindness, goodness, faithfulness, gentleness, self-control. Against such there is no law” (Gal. 5:22-23). The fruit2 of the Spirit (or spiritual fruit) is the result of the Spirit’s action and influence upon us. The nine items listed are traits, virtues, and attributes, developed within us; thus, we become more like Christ through the working of the Holy Spirit. The list of the fruit of the Spirit in Galatians 5 is not intended to be a complete account of all the possible fruit. The list is meant to provide, in brief form, a representative sample of what constitutes spiritual fruit. of righteousness and holiness, that is, righteousness and holiness bear good results in our lives (Phil. 1:11, Rom. 6:22, 7:4; Heb. 12:11). Righteousness and holiness are given to us upon Salvation, and the Holy Spirit works in our lives to enable us have lives that are holy and righteous. Thus, there seem to be many more fruit than those listed in Galatians 5. After Paul gave the list of gifted people to the early Church (1 Cor. 12:28-30), he told the Church saints it was proper to desire the best gifts, presumably meaning the most useful for their specific situation (1 Cor. 14:1-6). “But earnestly desire the best gifts. And yet I show you a more excellent way” (1 Cor. 12:31). However, the spiritual gifts were only going to be active for a few more years, then they would pass away when the perfect Word of God was completed (1 Cor. 13:8). The main emphasis of Paul was on the fact there was a more excellent way of administering the grace of God than by the use of spiritual gifts. While the gifts would pass away, something would remain, “And now abide faith, hope, love, these three; but the greatest of these is love” (1 Cor. 13:13). The three abiding items are not spiritual gifts, but are fruit of the Spirit; love and faith(fullness) are specifically mentioned as fruit in Galatians 5:22. The more excellent way was based upon that which would endure the entire age, not on that which would fade away. The fruit of the Spirit becomes an integral part of who we are deep inside. Paul says there is no law against spiritual fruit because it works for good, in contrast to the works of the flesh, which run counter to civil and moral laws. The fruit of the Spirit is what we should desire, since the attributes of the Spirit change our internal character and conform us to Christ. The believers in Corinth were told to desire spiritual gifts while they were still active, but there was a more excellent way coming. The gifts were in part, childish, and did not thoroughly equip the believers for the Lord’s work. The more excellent way is based upon that which would endure the entire Age of Grace, that is, the completed Word of God and spiritual fruit produced within the believer. The list of fruit in Galatians 5 implies three groups (as was the case for the gifts in 1 Corinthians 12). No original language requirement states there are three groups, but a logical grouping is presented. If there are three groups, the first three (love, joy, and peace) would relate to basic spiritual attributes that would be effective in any venue of life. The next three (longsuffering, kindness, and goodness) would belong to the second group, relating to our social interactions with others. The final three (faithfulness, gentleness, and self-control) would relate to our personal relationships: with God (faithfulness), individual people (gentleness), and one’s self (self-control). A true Christian is faithful to God, gentle to his or her neighbor, and has his or her self under control at all times. All the fruit come from the Holy Spirit, but He will only work in our lives as we allow Him; thus, we have to make sure we cooperate with the Lord in every aspect of our lives so that He can produce this fruit within us. The fruit of the Spirit is specifically designed for the believer’s spiritual life, not for ministering to a group. The fruit of the Spirit primarily changes the individual, and in a secondary manner, benefits flow outwardly, affecting social and personal relationships. Through the Spirit’s fruit, we experience personal growth in Christ, that is, we are conformed more and more to a measure of His likeness. In contrast, the gifts were given to individuals, for the purpose of ministering to a group and to glorify God. Gifts were less likely to provide an internal, personal benefit. Your Thoughts: Gifts were not complete but “in part,” and for childhood; consider how much better it is to have the adult characteristics provided by the Spirit’s fruit. 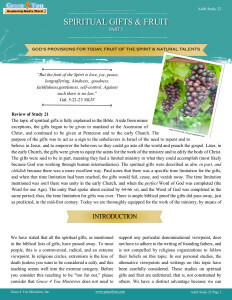 ← Study 21: Spiritual Gifts & Fruit – What Happened to the Spiritual Gifts, Why, and When?